WELLINGTON, New Zealand (AP) — An order from Tonga's education ministry banning girls from playing rugby at the Pacific nation's only public high school has been condemned by Tongan community leaders and a high-profile Olympic champion. 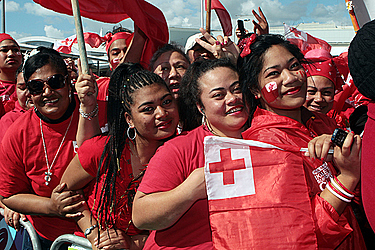 A letter signed by Education Minister Penisimani Fifita told staff at Tonga High School in the capital Nukualofa that girls should not play rugby or take part in boxing to "preserve the dignity of Tongan women and hold on to Tongan cultural values." After the directive attracted widespread criticism, Chief Education Officer Manu'Akau'ola said it was not culturally motivated, but reflected concern students had missed too much school because of Cyclone Geta which recently struck Tonga, causing extensive damage. "So his direction is not because we're not supportive of the sporting events, it's just (to) make up the lost time we've lost because of the cyclone," 'Akau'ola said. But critics were not placated. Two-time Olympic women's shot put gold medalist Valerie Adams of New Zealand, whose mother is Tongan, tweeted: "Tongan women must be free to choose their destiny and not be held back by misguided and stubborn misinterpretation." "When progress and tradition are in conflict we must ask ourselves what will bring the people the most benefit and how do we move forward together," Adams added in a radio interview on Wednesday. "According to this way of thinking, a proud Tongan like myself could not attain the standing I have in this world." Tongan women's rights advocate 'Ofa Guttenbeil-Likiliki said history and tradition were being used to deny women the chance to play sports at which they excel. "It takes us right back to the thinking that education is only academic and for girls to remain in that kind of academic lane," she said. "Sports is just the alternative for boys." Guttenbeil-Likiliki cited Teuila Fotu-Moala, who was player of the tournament at the recent women's Rugby League World Cup in Australia. "That story hit Tonga last year and made a lot of people proud," she said. "To see these women excelling in sport...I mean, you look at Valerie Adams. This letter from the Ministry of Education has taken us 100 years backwards."